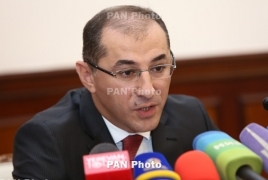 PanARMENIAN.Net - Acting Finance Minister Vardan Aramyan resigned on Thursday, May 10 as newly-elected prime minister Nikol Pashinyan is expected to form a new government within several days. The Armenian parliament on Tuesday elected Pashinyan, an opposition leader, as the country’s new prime minister after weeks of political standoff, a civil campaign against the ruling authorities and massive protests in Yerevan and across the country. He expressed hope that the new government will continue searching for efficient solutions to make the country more prosperous and economically stable. “I was trusted with the post of the Finance Minister which I accepted with utmost responsibility,” Aramyan said. “Our team sought to solve a number of key problems facing our country to help it overcome the challenges with dignity. Aramyan also said he will continue fulfilling the duties of Armenia’s Finance Minister until a new minister is appointed by the president. Earlier, Ministers of Culture, Defense, Territorial Integrity, Education, Environment, Sport, as well as many deputy ministers and top officials had submitted letters of resignation.